Received a tip off from a friend this morning about a book sale hosted by Marshall Cavendish this morning and I immediately made a beeline for it since it is not too far from home. 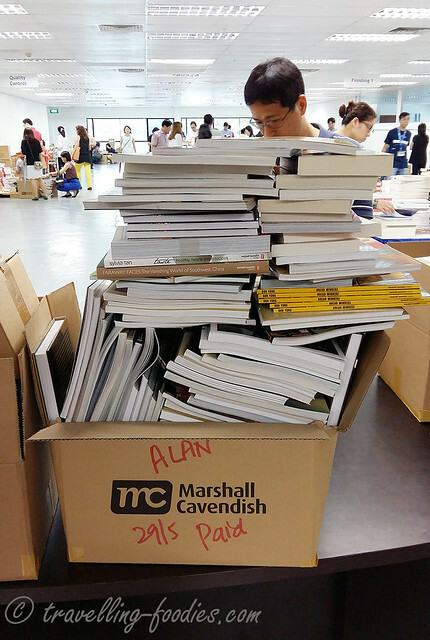 Unlike other clearance sales I’d been to where the books are individually priced and tagged, the books at this year’s MC Sale 2015 is sold by the cartons! Yes, you’d heard me right. 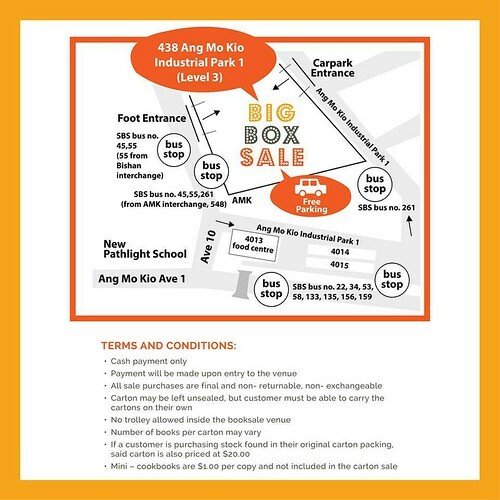 Buy a cardboard carton at the door for just 20 dollars and pack it up as much as you can carry! Bizarre it may sound, this is absolutely true! 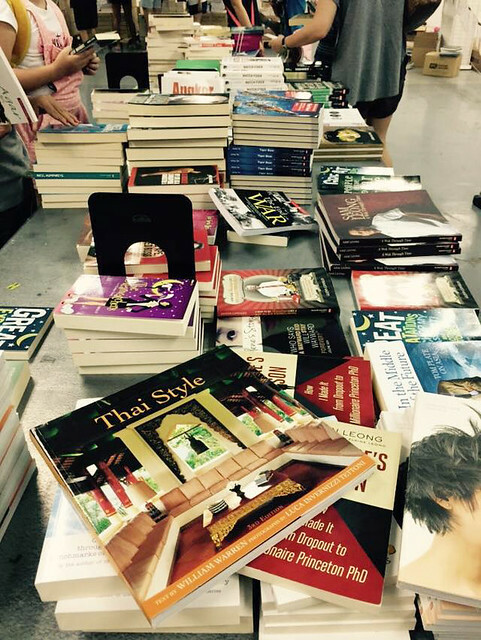 What caught my eye was the array of cookbooks available for grabs at the sale. Despite being under the weather, and still recuperating from my HK trip, I must make a trip down and indeed I did! 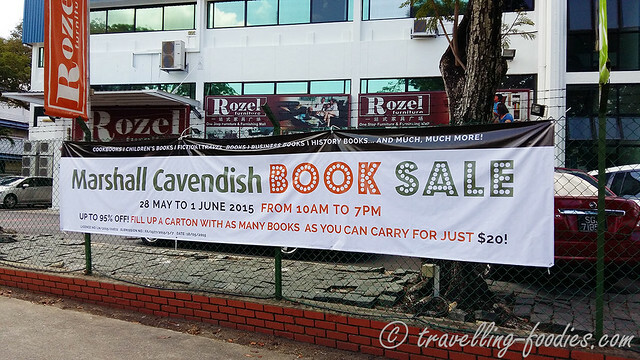 The Marshall Cavendish Book Sale runs from 28 May (today) for 4 days until next Monday. The banner says up to 95% off and I must say I was in total disbelief when I read it on the way from the bus stop to the building. 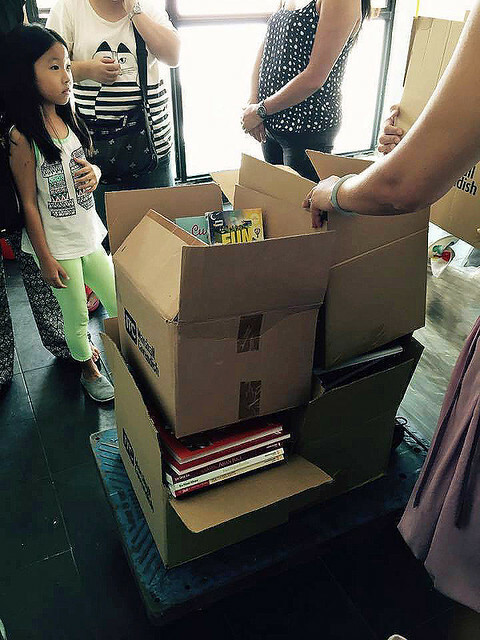 But just barely an hour later after I walked out, got on a cab, reached home and packed the books I’d hoarded and did my math…. it’s true… 95% sale indeed…. OMFG…. 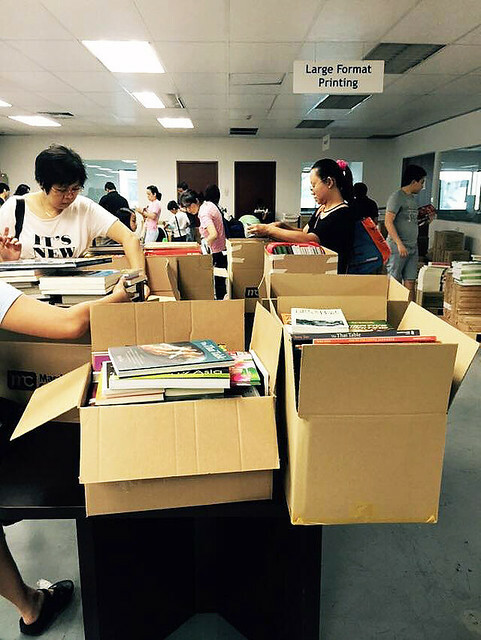 Here are some in-situ shots of the sale, taken by my friend 丽爱 who was there earlier than me. I was too busy grabbing books as soon as I got into the event hall that I forgotten all about it. Thanks 丽爱 for the usage of the shots! As you can see, the books are quite mish mash. No, they are not categorised in accordance to genre whatsoever. At least not from what I saw when I got there just before noon. 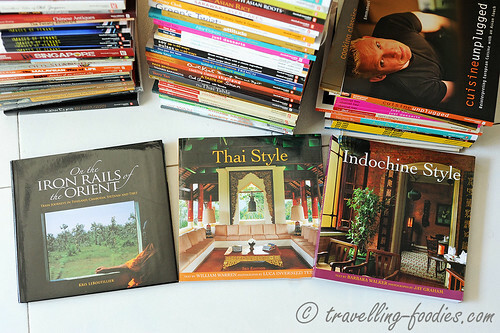 There are a good selection of non-fiction books, most notably the cookbooks which has been spread out across the whole floor space, albeit unwittingly to prevent the cookbook lovers from congregating all at one tight corner, elbow to elbow fighting against each other for the last copy of some popular titles. It takes quite a bit of treasure hunting to find what one wants but all the more to the fun I guess! 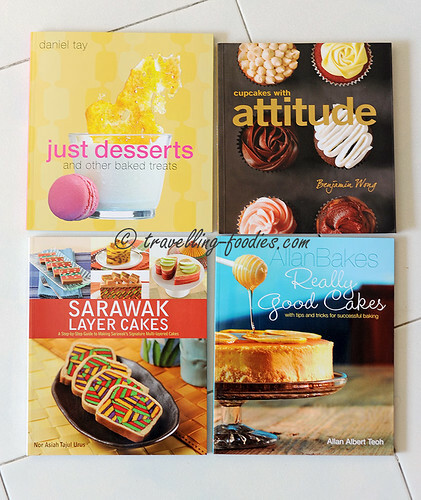 I was told that some titles fairly quickly, like Cecilia Tan’s “Penang Nyonya Cookbook”. I missed getting a copy but thankfully, managed to secure one from 丽爱！The children books were totally grabbed up in less than 2 hours as I saw none when I was there. Yes, here’s what the cartons for sale at the counter look like. They go for 20 bucks a piece and you can pack ’em up with any books you want, apart from the periplus minibook titles which are on sale near the door which are sold separately. Some folks came well prepared, with the entire family entourage, trolleys et al, with 4 large cartons filled with books worth waaaaaaaaay over the 80 bucks paid for. So how did I do? Well, I think I did pretty well, despite being slightly late. Really to see my carton of books? So what did I bring home? Let’s take a look! 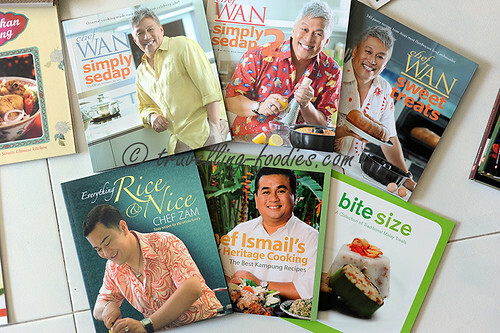 First are titles from Chef Wan, Chef Zam and Chef Ismail… renowned celebrity chefs from just across the causeway. A surprise find! Mrs Leong Yee Soo’s titles from her book set, albeit incomplete but still a wonderful find! 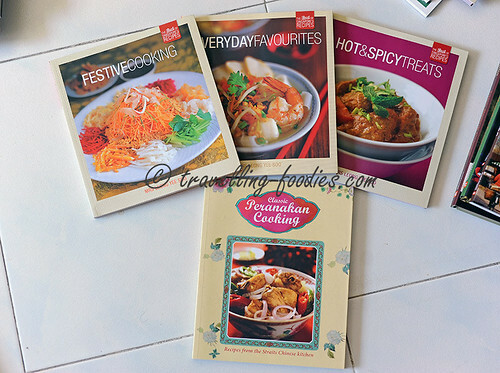 And there is “Classic Peranakan Cooking”, a tie-in published in conjunction with the very popular “Trail of the Phoenix” series featuring Baba Kenny Chan. The photos are set in original antique Nyonyaware, on loan by Katong Antique House and it is always a pleasure to view photos for inspiration, not to mention try out the recipes. 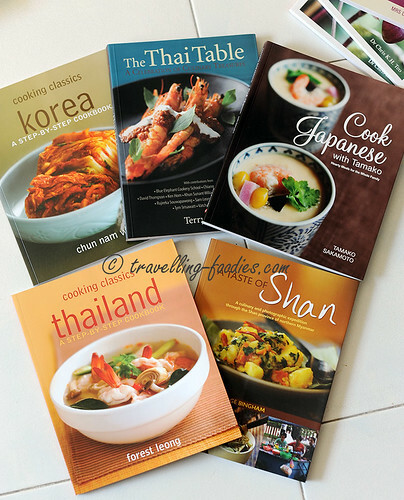 Spreading outwards to the nearby regions, there is a good selection of cookbooks from other parts of Asia. The cuisine which I know least and thus most curious about is Burmese cuisine featured in “A Taste of Shan”. 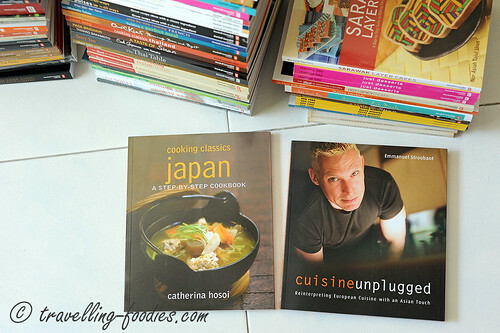 Other titles feature cuisines from Korea, Thailand and Japan. 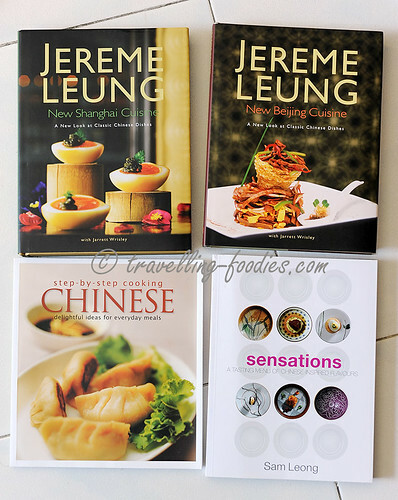 The selection of titles from Chinese cuisine comes strongly from those by Jeremy Leung and Sam Leong. Chef Jeremy Leung (梁子庚) is a Hong Kong-born, Singaporean chef who ventured and made it big in China, best known for his take on “new Shanghai cuisine” as well as his appearances in Masterchef China. Sam Leong needs no introduction in the local culinary scene, having penned several cookbooks, made TV appearances numerous times, not to mention helming his own restaurant and cooking school, with his wife, Forest Leong. 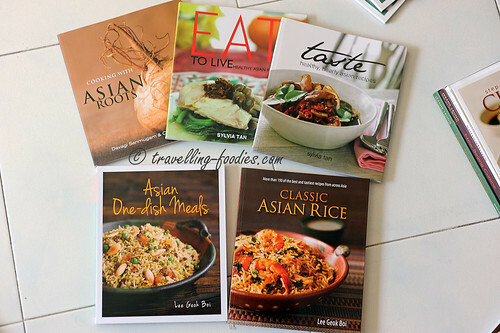 Then comes some cookbooks on more “generic” Asian cuisine, by Lee Geok Boi and Slyvia Tan, the latter said to be the most prolific cookbook author in Singapore to date. 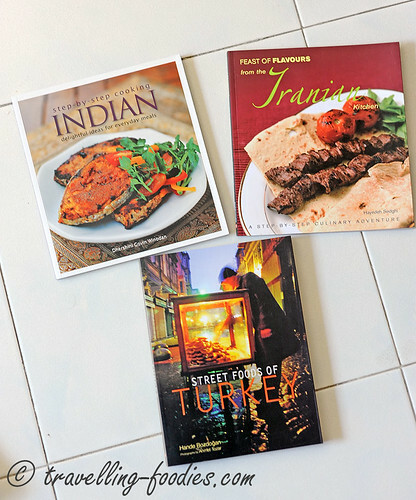 Going slightly westwards, we have cookbooks from India, Iran and finally Turkey which stretches the entire Asia Continent from the far east (Japan) to the exotic west. Apart from one lonely French title, a few other cookbooks available are non-regional cuisine specific but still worth getting I think. 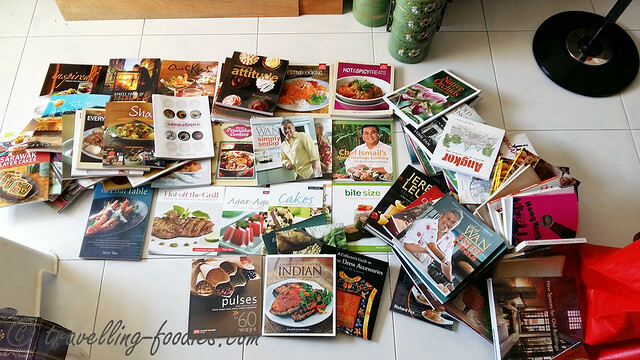 More cookbooks to look at yes! 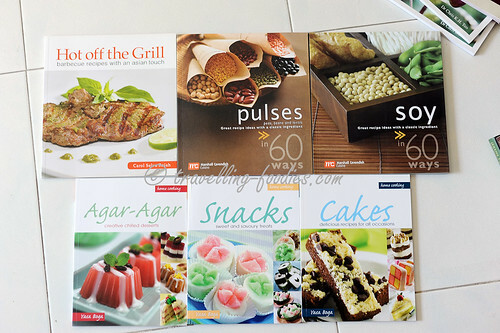 I’d like the books from Yasa Boga, especially those on Indonesian cuisine and desserts so I was pleasantly surprised to find their range of cookbooks at the sale as well. 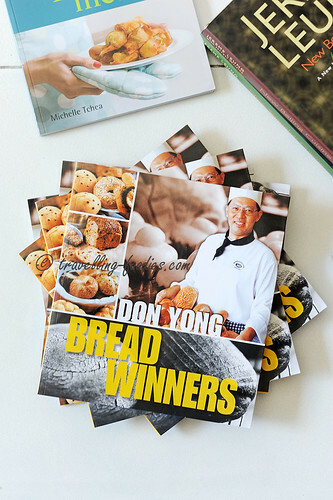 Possibly the only bread book at the whole sale. There weren’t copies displayed but all still packed within their cartons. By a fine stroke of good luck, I happened to read this title on the carton and got curious enough to open it. Got extra copies to giveaway to friends. 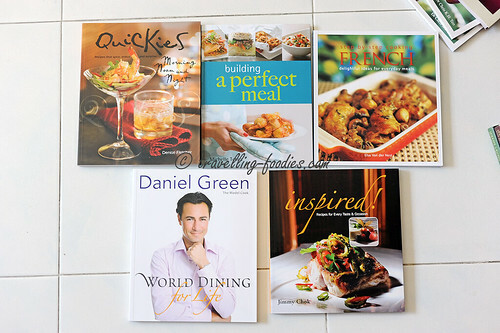 Apart from cookbooks, there is also a good selection of other non-fiction titles available. Beautiful coffee-table books for a lazy afternoon’s browsing alongside a good pot of tea with some scones perhaps. 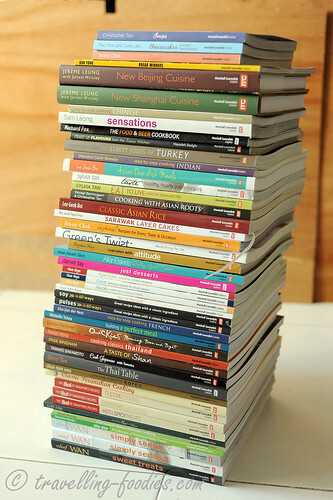 This is my stash of cookbooks garnered from the sale. 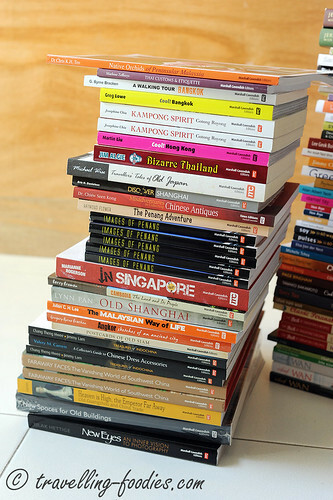 And this is the tower of “non-cookbooks”, mostly related to the sights and sounds of our region, from old postcards of Siam, to Images of Penang. I’d picked up multiple copies of certain titles for friends whom I knew would be interested in them but could not make it for the sale. Let’s hope they would like them! So if you have the weekend free, it my be worthwhile to drop by and take your pick of your favorite titles. Who knows what interesting books you might find!!! This entry was posted on May 29, 2015 by Alan (travellingfoodies). 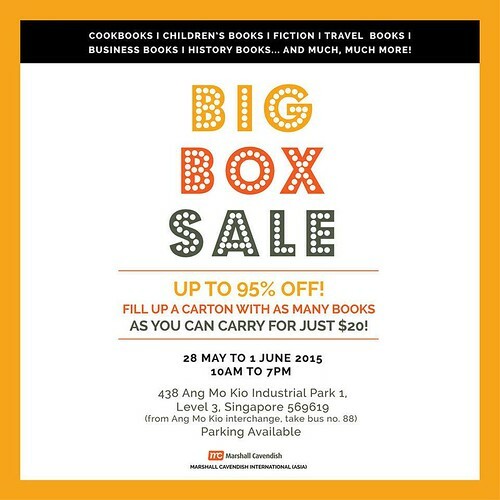 It was filed under General and was tagged with big box sale, cookbooks, marshall cavendish book sale, pansing.